There are dozens if not hundreds of products available on the market that claim they can help you stop snoring. Finding the right device or product to help you get a good night’s sleep can be a process of trial and error, and it often takes trying several different products to find the one that will work best for you. Most anti-snoring products work to adjust the position of the jaw and mouth as the user sleeps. For example, the SnoreRx customizable anti-snoring mouthpiece works to advance the jaw in the mouth as you sleep, which keeps the jaw from malposition and stops the user snoring. Other common anti-snoring products include mouth guards, chin straps, and pillows. While devices placed in the mouth work well for many people, they are somewhat invasive, require intense cleaning, and may be uncomfortable. Pillows and chin straps work well but cannot be used in all circumstances and are less effective for some snorers. For those who are looking for a less invasive anti-snoring option, there is a new product available on the market: The Snore Circle Eye Mask. The Snore Circle Anti-Snoring Eye Mask represents the latest and greatest of anti-snoring technology. The underlying concept of the eye mask is relatively simple. It uses 36 levels of barely perceptible micro-vibrations to prevent the user from snoring. This cutting-edge technology can detect when the user begins to snore. It then uses the small vibrations to physically intervene, causing the over-relaxed muscles of the neck, throat, and jaw to tighten. This means that rather than waking up due to the noise of snoring or not breathing, you can rest peacefully and fall into an even deeper sleep. When the user is in a period of not snoring, the mask is not active or vibrating and is easy to sleep in comfortably. The primary benefit of the Snore Circle eye mask is simple: people who use it say that it works! Relief from snoring allows for improved quality and duration of sleep, which has a legion of positive health benefits physically and mentally, from reduced depression symptoms to better heart health and so much more. One of the main benefits of the Snore Circle mask is that it is non-invasive. It simply rests over the eyes in a manner similar to wraparound sunglasses. Unlike a mouth guard, there is nothing that needs to stay in the mouth and potentially irritate sensitive tissues. Users report that it is very comfortable around the face and not bothersome. Unlike many anti-snoring pillows, this mask is easy to bring along for travel purposes. It is small and easily portable. 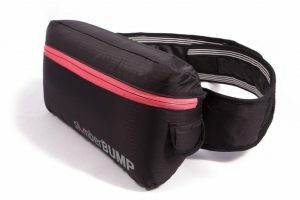 Unlike many of the chinstrap-style anti-snoring products, it is not uncomfortable and embarrassing to use in public. In fact, if you wear it in public. most people would have no idea that it is an anti-snoring device or that you snore at all. Whether you are napping at work, trying to get a good night’s sleep on a transcontinental flight, or sharing a long car ride with strangers, this mask can help you void unwanted public snoring and sleep comfortably as well. Another benefit of the Snore Circle mask is that it could be used in combination with other anti-snoring methods. It could easily be used with an anti-snoring pillow or a mandibular adjustment device (MAD) to gain the beneficial effects of both of these technologies. Finally, the mask uses an app system that allows you to track your sleep and snoring and empower yourself with information about your sleep patterns. 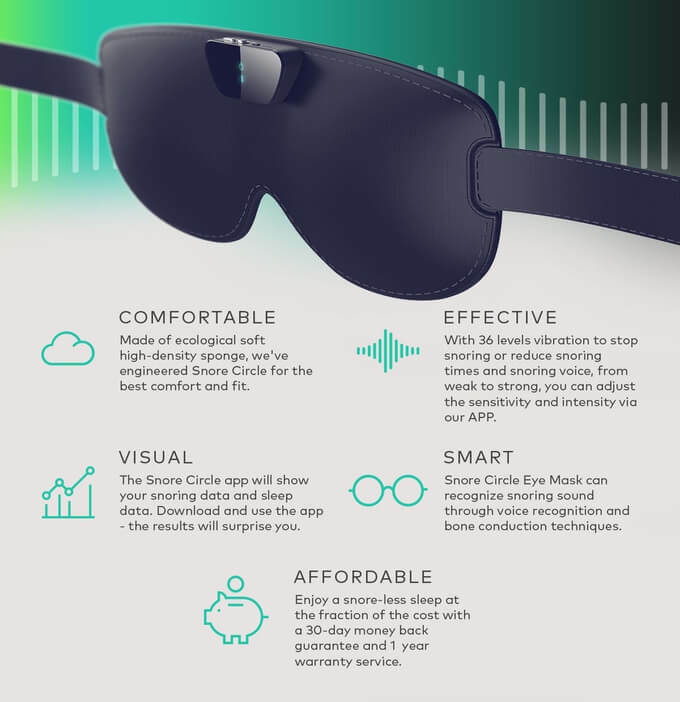 The Snore Circle anti-snoring eye mask truly represents the way of the future as far as anti-snoring technology is concerned. The device is fully integrated with a mobile phone app that tracks quality and duration of sleep, snoring volume, quality, and time, and so much more. It can also tell you when the device was active and for how long. This allows the user to adjust the sensitivity or type of vibrations the device is putting out and optimize them for their own needs and preferences. Those who suffer from snoring know just how relieving it can be to get a good night’s rest. The Snore Circle mask is an important tool for preventing snoring. With this mask, users are sure to improve their quality of sleep, rest easier, and enjoy the positive health effects that consistently sleeping ten to result in.